The first Hunter Walking Trail had a parking spot by a gravel pit so that made it easy to get to. This area had a fair number of hills and steep climbs. Tina and I worked our way up one of the bigger hills and she had a few instances where she got birdy but we didn’t move anything. Instead of walking down the trail the same way that we came up I decided to go cross county to an area of clear cut that I could see from the top of the hill. As we reached the clear cut I found a nice trail in the area and we worked our way along that trail back toward our original trail. Tina kept working scent but it didn’t seem like her normal mode of operation. We went around a steep corner and Tina started to stop and relocate multiple times in one small area. I started to walk in when I happened to look up and about 20 feet up in the tree was a big porcupine. Having had a $500 dog porcupine incident a number of years earlier I tapped Tina with the ecollar, got her to my side and we started back to the truck. We ended up not moving any birds in this area but not having to spend the day removing quills or ending up at the vet like last time made me feel like it was a successful start to the hunt. Marge got to get out at the Bowstring Hunter Walking Trail. This trail has a nice range of covers. The first section was an area that I think would be underwater in most years but was dry this year. We made our way along that part of the trail for a while until it became clear that the walking was not going to get any easier for Marge so we turned around an started another section of the trail. The walking here was much easier and about five minutes along the path Marge went on point. I tried to walk towards the cover but the bird flushed before I had a chance to get into position. Just 50 yards farther down the trail Marge went on point again. This time the bird was closer to the trail and I was able to connect on a nice left to right shot. Marge even went off into the brush to pick up the bird. Another minute or two down the trail and we had a wild flush that I wasn’t even close to ready for. Basically in the space of a hundred yards we had two nice points and a wild flush. Those did end up being the only birds that we moved on this trail but it ended up being a worthwhile stop on a new trail. After giving Fergie a bit of a walk down the trail we loaded up and headed to the new honey hole. Tina got the call as the first hunt ended up being a bit on the short side. Tina went on point only about 30 yards from the truck. She was off the trail in an area of small trees that had been blown down. Even though she was solidly on point I was a bit skeptical as we were so close to the truck. I should have been more confident in her as the grouse took off not 15 yards from her and I missed an easy straight away shot. The bird almost flew right over the Trailblazer. That there was a bird there shouldn’t have surprised me as earlier in the season we got two birds about 10 - 20 yards from where Tina had just pointed the latest bird. After recovering from being ticked at myself for missing an easy shot we continued to make our way. I was curious if we would see the same numbers of birds that we had seen jus the day before. I didn’t have to wait too long to find out as we hit a lower patch of cover and Tina made another nice point and this time it was a woodcock that was being pointed. I flushed the bird and passed on the shot. I actually tried to walk in on the bird in a manner that would make the bird flush farther along the trail so that we could get another point on it. It didn’t work out that way so we just kept on working our way along the trail. On the return trip Tina was working off to the left and I heard something move on the right side of the trail. I saw a rabbit slowly moving way from me and took the shot and had the animal in the game bag before Tina made it to the area. I had seen a few rabbits earlier in the season and had decided that if I had a shot at one when a dog wasn’t around that I would take it as I have been wanting to try some type of a stew with rabbit in it. As we moved along the trail we got to one of the areas of heavier cover and Tina started to get birdy. After a short distance she locked up and the bird was kind enough to be holding near the trail and presented me with a shot that even I could connect on. After taking a woodcock we arrived back at the start of the trail. We had another big hunt in the Winnie area planned for next day so we decided to head home while it was still light out. This turned out to be the last hunt of our adventure of staying and working in Grand Rapids as the next day Tina had a slight limp so I decided to pack up the cabin that we had been renting for the month and head back to the Twin Cities. It had been a good month of hunting. The start was too hot for optimal hunting but the dogs still put in great hunts and we consistently saw birds. I also got to spend some time with a number of different friends in the area and got to hunt with a few others that came up to the cabin. 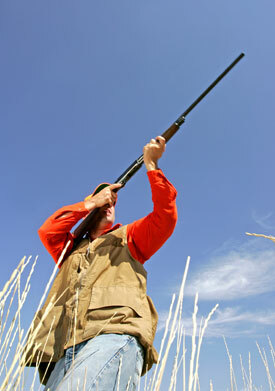 When going grouse hunting it usually helps if you bring the f’n guns with. I had planned on trying out two new ( new to me ) Hunter Walking Trails in the Bowstring area but as I was 40 minutes into our 45 minute drive I realized that I had forgotten to put any guns into the Trailblazer. I turned around and went back to the cabin, grabbed a gun, and headed out back to hunt. Since I had lost 90 minutes of hunting time I decided to head back to my new old reliable walking trail. Tina got the call as usual. We made our way past the the first blow down without moving any birds but she started to get real birdy as we approached an area that is blowdowns and a few pine trees mixed in. She went on point about 20 yards into the blow down and as I tried to pick out a good spot to move towards her a grouse took off another 10 yards past her. I wasn’t quick enough to get off a shot. After another 15 minutes of walking we came to an area that was a bit lower and wetter than the surrounding terrain and Tina started to tighten up her range. She tightened it up to a nice solid point. I made my way further up the trail and started to cut back to her in hopes of trapping the bird between us. I got closer and closer and no flush but also no movement from Tina. I got close enough to start to check out the cover right in front of her and was able to spot the woodcock right in front of her. One more step and the bird came up. I held off on the shot as I’m not that big on eating woodcock. As the day progressed we moved a total of seven woodcock and I ended up taking one to reward Tina for all of her hard work. Towards the end of the trail we took a smaller trail that loops through a newer area of clear cut as we got to the transition area Tina locked up and was looking off to her left. I was looking for a way in when the grouse made its escape from behind a pine tree. Two steps either direction and I would have had a clear shot but as it was I could only just watch it fly off. The next bird wasn’t so lucky. We had turned around and were headed back through a section of small pines when Tina started to move into the cover. I could hear her making her way through some of the thicker area and then I didn’t hear her moving any longer. Her point was confirmed by her beeper going off. I continued up the trail a short distance until I could find a good entry point. I made it about 15 yards into the cover before I could see that she was still in full point mode. Just as I pulled even with her the grouse flushed and gave me a right to left passing shot. I connected but it wasn’t a fatal blow. Tina gave chase and brought the bird to me. She doesn’t always do a full retrieve so that fact that she did made it extra special. On the rest of the walk back to the truck we moved three more grouse and I wasn’t able to connect with any of the birds. As usual the problem was between the gun and the boots. Considering that the day started with me making a major blunder I was happy to have moved six grouse and seven woodcock while collecting one of each. The kennel, Northwoods Bird Dogs, where we got our latest Setter and have had our other dogs trained has announced their 2012 litters. Three sets of English Setters litters and one English Pointer litter are planned for 2012. We really like our Setter and how the others were trained so we feel pretty good about passing along a referral.